One of my friends can now use a average low 3 star quality team to lead a league. The average quality is 70.3. At level 13, it just reaches 3 star. The team has many 4 star (appearing as 2 star in eyes of my L15 team) players with SA, but does not have even one 5 star player. He has a comfortable lead in league. I checked some teams in same league. Their qualities are similar. Constructing an average 3 star team by the end of the season is now an alternative to take over a 2 or 3 level lower team. If the manager is active and buy some 5 star player after league draw, their team quality will be easily higher than most others'. At the same time, their team may also enjoy to participate a easier cup. This may be a easy way to collect titles. I am considering even though I wonder if I will have fun to play in this way. Last edited by cookizzz; 06-19-2015 at 03:48 AM. Last edited by nikolgiorgos; 06-19-2015 at 06:16 PM. Blackkiwi and johnp like this. This is another team from my CH.L. groups (cannot read the name ...), a strong one this time. It's in 2nd position in a strong league, full with 5*-6* players teams. Interesting thread, I've noticed that new league system too. Personally I like playing in such strong leagues, it is way more interesting and challenging than playing against 3* teams. I've said that already and I'll repeat; If someone wants to play constantly against 3* teams and brag about winning league every season, then one should takeover new team from level 1 each season (to get such weak oppos). What is point of playing in weak league? If there is no challenge, why then play it at all? Someone might say that this isn't fair system because some 3* team can play CL without investing alot while some strong 5* team and that's true. But remember that there are also inactive and bad form teams in such strong leagues and some "managers" might also decide to tank in such league. No offense, but one who tanks in equal Q league is no true manager. Accept the challenge, go big or go home. I cannot agree with your thoughts but there are some issues. First I would like to have some more "easy" games in my league. I bought two players and wanted to test them in 1-2 games. This is a bit risky now. Today for example I played with the 12th of my league and managed to win 2-0. He had ten 5* players and one 4* (and ex-championship winner). Only the last two teams of the league are easy games for testing and rotation. I prefer a league with 4-5 low q teams, 4-5 average q teams and 4-5 good q teams. Last edited by nikolgiorgos; 06-20-2015 at 03:20 PM. Another thing is that the value of a low or high q championship is the same. I would like the idea that a manager could choose the quality of the league he would like to play. So, this season I would like to play in a challenging league (because I have good players, some extra sources, more time) but next season, I would prefer to play in an easier league. Last edited by nikolgiorgos; 06-20-2015 at 03:18 PM. johnp and Tactician like this. So lv14 and it seems that the new "quality draw" in leagues, is here to stay. My league, almost all the teams with the same quality. some teams had few low quality players in their squad, but extra from the 14 with the highest quality, so it seems that this draw is working like the Cup quality draw, with the fist 14 players. Last edited by nikolgiorgos; 06-30-2015 at 03:53 PM. while other managers playing with the minimum, have the same chances with me, for winning a trophy (the Cup and the League for sure). I feel like I get f... , but I prefer to ask me before, and giving me a hug and kiss after. Oops, just realised I posted mine in the wrong thread. Here's the Average Q Draw. For those that see thing better with stars here's the Bottom & Top ranked teams and mine. Unfortunately its difficult to find anything really meaningful - there are a few teams in my league with unsigned players and it won't be possible to see what they actually look like until Day 8. Basically, if it was a 'similar Q' draw then it looks like a league of 2 halves: half a league of mixed ability from 3-5* (Similar Half A) and half a league of real crap (similar half B) ie half from a 'competitive' pool and half added from whats left. Bt that's me really stretching things to try to make it fit. If there is a 'similar Q' draw then its not Top 14. Even Full squad average produced a >10Q spread. So I can only repeat, if there's a balanced draw I'm not seeing it. However, I do have the gut feeling that the crap teams in the CL groups are getting crappier - not sure if that's normal for Level 15 and over or due to bottom feeder leagues. 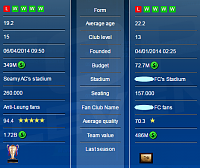 And yes, I'll be adding friends for next season to try to ensure a competitive league rather than leave it to chance.